A meeting of Fine Gael TDs and senators in Leinster House has unanimously passed a motion in support of Tánaiste Frances Fitzgerald. The parliamentary party issued a statement following the meeting, saying it stood firmly behind Ms Fitzgerald. Fianna Fáil will today lodge a motion of no-confidence in the Tánaiste and it will be scheduled to be debated in the Dáil on Tuesday. 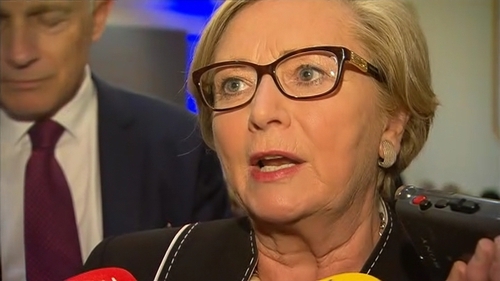 Should Ms Fitzgerald not resign before Tuesday, the Government will fall and a December election will follow. There is still an expectation that Taoiseach Leo Varadkar and Fianna Fáil Leader Micheál Martin may talk but neither looks like backing down at this stage. That means it is either a resignation or an election. Fianna Fáil's motion is a result of the ongoing row over an email sent to Minister Fitzgerald in May 2015 relating to the Maurice McCabe affair. Earlier, Fianna Fáil's justice spokesperson said his party can no longer express confidence in Ms Fitzgerald and she "should go". Speaking on RTÉ's Six One News, Jim O'Callaghan said the events of the last week undermined the confidence and supply agreement between Fine Gael and Fianna Fáil. He said Mr Martin had spoken yesterday by telephone to Mr Varadkar to express this view. Sinn Féin earlier tabled a motion of no confidence in Ms Fitzgerald over her handling of the garda whistleblower controversy when she was Minister for Justice. Ms Fitzgerald has been under pressure over her account of the email she received in relation to the legal strategy of the former Garda Commissioner in the case of Sergeant McCabe. He said Fianna Fáil bears no grudge against the Tánaiste, but if there is a vote next week it cannot express confidence in her. He said if there is a General Election as a consequence of the vote so be it, but it is the party's hope that the matter will be resolved and Ms Fitzgerald will resign. Minister for Foreign Affairs Simon Coveney has confirmed the Government will continue to support the Tánaiste. He said calls for her resignation from Fianna Fáil and Sinn Féin were "built on sand". Earlier yesterday, speaking on RTÉ's Drivetime, Minister Coveney said Sinn Féin do not want due process to take its course, saying a tribunal is looking into the issues surrounding Sgt McCabe. "We should allow that process to conclude these issues, rather than trying to prejudge them now in a way that, I believe, to be unfair on Frances Fitzgerald. "That's not to say that this has been handled well in the last number of weeks in terms of confusion around who knew what and when; who got emails, when and if they read them and who was told about that. "I accept that doesn't look good, but this is not a resignation issue." Mr Coveney said Sinn Féin wants to prejudge and undermine a person's political career and said he hopes that Fianna Fáil will recognise the need for due process. The Minister for Health described the Sinn Féin motion as a political stunt and an attempt to usurp the Charleton Tribunal. Speaking outside Leinster House, Simon Harris said the Government retains full confidence in Ms Fitzgerald. Mr Harris said he trusts Mr Justice Peter Charleton to investigate this issue and not Sinn Féin's Mary Lou McDonald, who he said had a new found interest in investigating bullying. He said he expects the agreement with Fianna Fáil to continue and insists there is no evidence that Fianna Fáil will not honour its agreement. The email was initially sent to Ms Fitzgerald in May 2015 but she told the Dáil earlier this week that she could not remember reading it. The Department of Justice confirmed this week that the email was found on 9 November as part of a search of records in response to a parliamentary question. Sinn Féin said its motion is due to be debated next Wednesday and voted on Thursday 30 November. Ms McDonald said after a week of discussion, speculation and questions the Tánaiste had not given any satisfactory explanation. Speaking on RTÉ's News at One, she said Minister Fitzgerald "has clearly failed in her duties" when she learned the garda strategy "was so utterly malicious and designed to ... ruin Sgt McCabe's life". She said Ms Fitzgerald's position had now become untenable. It comes as the Department of Justice confirmed that current Minister for Justice Charlie Flanagan was made aware of the email on Monday 13 November. Mr Flanagan said it came during a phone call from the department’s secretary general where the primary purpose was to inform the minister of his decision to retire. Ms Fitzgerald is already on the record that she was informed it had been found on Thursday 16 November. Responding to questions from Mr O'Callaghan, Ms Fitzgerald said there were "no efforts" by her to suppress the email and she did not believe by anyone else. She said a process was being followed in the Department of Justice in relation to the email. Mr O'Callaghan said Taoiseach Leo Varadkar gave false statements to the Dáil last week due to the information he had at that time. Ms Fitzgerald said the Taoiseach put the information he had on the record. The controversy centres on an email sent to Ms Fitzgerald when she was Minister for Justice. The correspondence set out the legal strategy that was initially about to be pursued against Sgt McCabe at the O'Higgins Commission. The opposition has described that strategy as malicious. They say the Tánaiste should have acted on it when the email was initially sent to her in May 2015. Ms Fitzgerald said she did not remember reading the correspondence and she said it made clear that she could not legally intervene. It has also emerged that the email was found by the Department of Justice a fortnight ago during a search for an answer to a Dáil question posed by Labour TD Alan Kelly.